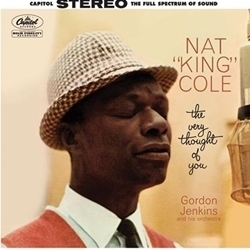 Nat King Cole and arranger Gordon Jenkins followed their hit 1957 albumby foraging further into romantic and sensual bliss the following year with the 1958 release of The Very Thought Of You. With the spotlight squarely on Cole's unsurpassed voice, as the songs are devoid of pianos or jazz-based instrumentals, this ballad-dominant set thrives on the strength of Jenkins' sweet string work and Cole's emotional, honest deliveries. Everything from the classic title track to the wishful "Making Believe You Are Here" is pure pleasure. If you buy just one Cole record, make this the one. And how. Never before has this record sounded so sumptuous, with every detail and nuance restored in a manner that places you in the recording studio with Cole. Nat King Cole possessed one of the most accessible and appealing voices of any singer in the 1950s. This ballad-oriented set puts the emphasis completely on his voice (there is no piano playing or any hint of his jazz-oriented past) and features Cole accompanied by Gordon Jenkins' sweet arrangements for a string orchestra. Mastered from the original three-track analog master tapes at Acoustech by Steve Hoffman and Kevin Gray for an unparalleled sonic experience. The combination of music, sound, and emotion is positively scintillating. But that's not all. Analogue Productions went even further to make this an unbelievably definitive reissue. So, when I saw that the master tapes were to be issued by Analogue Productions I ordered this and the 6 other discs on schedule to be released by that firm. I have seldom had such bliss from renewing a friendship with an old LP. As happened with the Living Stereo reissue of the Brahms First Piano Concerto with Rubinstein, the tapes from this Capitol recording have yielded results that can be called nothing short of phenomenal. Yes, the RCA suffered from master tape limitations, but such is NOT the case with this disc. There are THREE forms of the album on the disc. The SACD stereo section contains the stereo mixes and the monaural mixes of all the tracks, both from different microphone set-ups; but the three-channel master tape is the very best treat on this disc. The stereo versions, according to the notes, are from minimalist microphone set-ups. The orchestra, rhythm section, massed strings, and harp, sits in a semi-circle behind the singer, and EVERY nuance and coloration of his velvet voice is captured and presented with a depth, intimacy, nuance, and subtlety I have NEVER experienced while listening to previous issues of this disc. The Gordon Jenkins arrangements, with all their lushness, chromatic complexities, and melodic contrapuntal invention, are reproduced, nay, ETCHED, like a luminous cloud behind the singer. Resolution allows subtle colors of the instrumental sound to emerge that were buried in previous incarnations of these recordings. The floor arrangement and depth changes from selection to selection, adjusting to each arrangement. Also, the mixed strings are spread wide in the stereo perspective, somewhat like the divided violins required in the old European orchestra seating. The result is nothing short of magnificent. I am finding it difficult to reach for additional superlatives in hearing this disc. It is a major contribution to the restoration of landmark recordings of one of the greatest ballad singers and jazz musicians in the history of the world. , lets us hear EVERYTHING those wizards at Capitol got onto those tapes. I felt as if Nat Cole was standing in my living room and I was in a time warp. I cannot find enough praise for the restoration team that put this release together and put this musical treasure If it is not obvious by now, I recommend this disc to anyone who wants to light a fire, pull up a glass of wine, and have a sublime artistic experience. GET THIS DISC, NOW! I cannot wait to receive the other restorations of the Nat "King" Cole catalog from Analogue Productions. I hope they sell thousands of copies of this disc. It has made me very happy.